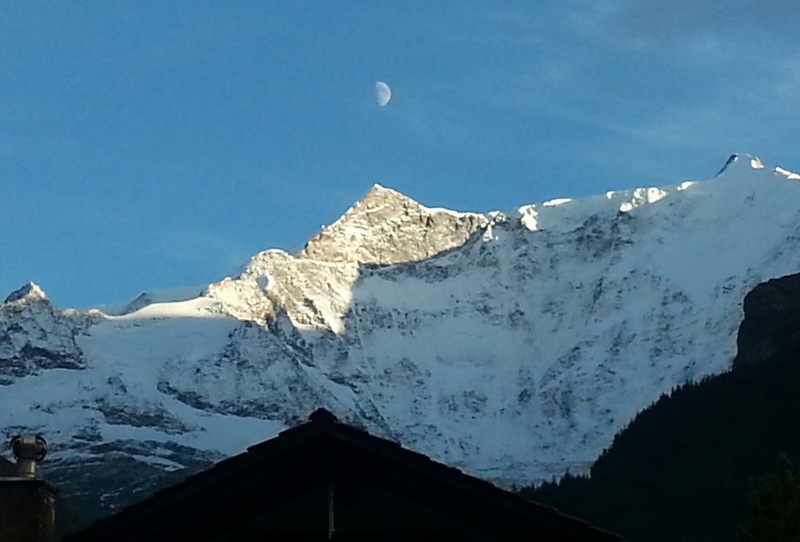 We are having a few days to ourselves in Grindelwald. On Friday, the first day after finishing the Alpine Pass Route on Thursday, we had a short walk with Rob to the lakes near the First lift above the village. The clouds were going up and down on the tops of the big peaks which added to the pictures, as long as you had a bit of patience! This moon shot was taken on my phone as we went to dinner. Saturday was a good day too so we returned to the waterfall below the Klausen Pass. We came past it on our 4th day on the Alpine Pass Route but the clouds were down and it was raining. Nice traditional chalets in the foreground though. It was warm and sunny on our return. It took us over 4 days to walk from the falls to Grindelwald and just 90 minutes to drive back, then a 40 minute walk. 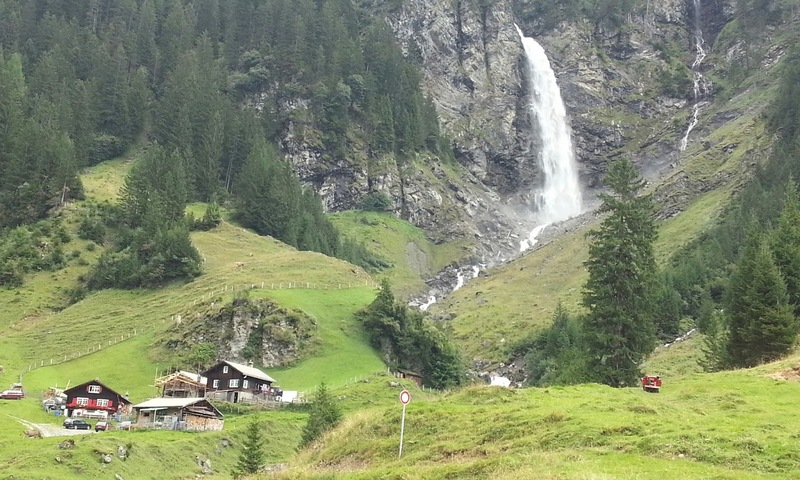 The waterfall is called the Staubi Waterfall in the village of Asch and is 90 metres high. I took photos with chalets in the foreground and the waterfall behind. Then I climbed up the hillside to the foot of the falls. It needed a scramble to get down into the riverbed. This put lots of small waterfalls into my shot with the big fall behind. My back was too painful to get right down to where I thought the best shot was but I made the tripod go quite low where I was able to get to and it still looked good. All the important photos were taken on my Mamiya 7 film camera so it will be a few weeks until I get to these. I forgot to take similar photos on my Samsung S3 phone to illustrate this blog. I did take one as we were leaving the village to give an idea of the beautiful setting. We have had a couple of wet days so taking it easy with short walks and no photos. Tomorrow we leave the mountains and head to Luxembourg for some city photos as we make our way home.